Banana spotting bug (Amblypelta lutescens) causes major damage to avocados, macadamias, paw paws, limes and many other exotic fruit in Qld. Unlike it’s cousin Fruit spotting bug (A.nitida), BSB is mainly present north of Nambour to Atherton. Up till now growers have found it almost impossible to monitor for his very cryptic bug. 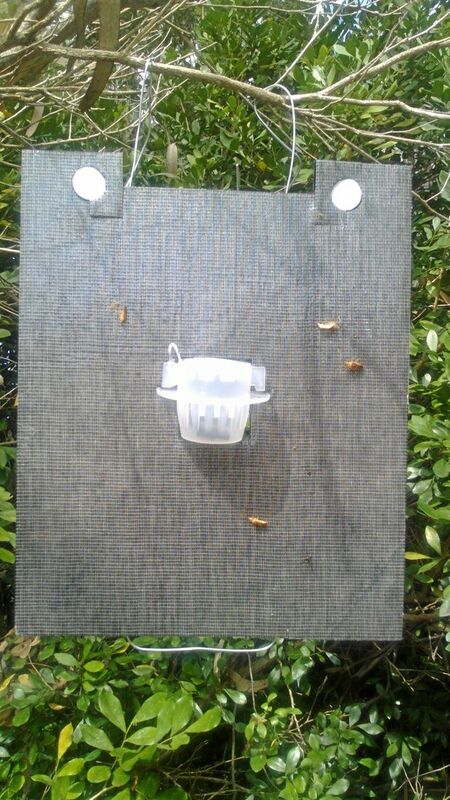 Now with the BSB trap and lure, growers can capture nymphs and adults and be able to make spray threshold decisions based on the numbers they are catching on the specially developed sticky boards. The system may look simple but due to the strength of the bug a special glue had to be developed which can stand the test of humidity and sunlight while remaining sticky enough to stop the bugs walking off the boards. The aggregation lure took Qld DPI years to perfect due to both the nuances of raising the bugs in captivity to conduct the studies but also the very complex chemical ecology and anatomy of the bug. The BSB trap is sold as single units or as a pack of 10 which is enough to monitor the insect over 1 ha of crop for a 6 week period. It is expected that over time growers can reduce the number of traps as they build up knowledge of where the hot spots are so that the concentration of traps can be placed in that area. Supplies of the trap will be through your local retail outlet and as usual your local OCP Agronomist will assist you with the technical aspects of the use of the trap. Go to the INSECT TECH RANGE for further information.